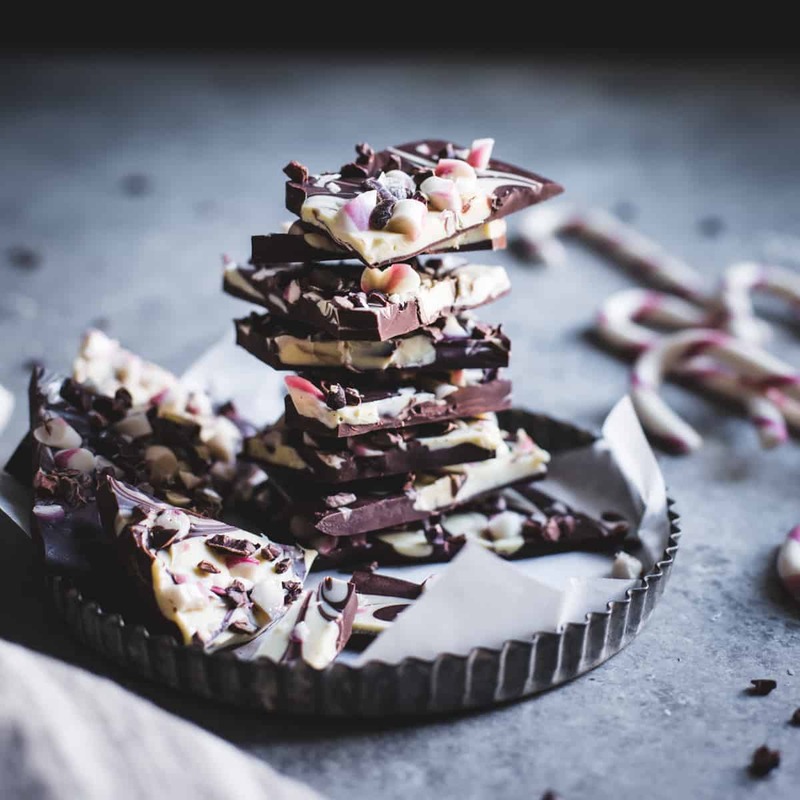 Peppermint bark grows up with extra dark chocolate, a smattering of cacao nibs, and a few flecks of flaky salt, no tempering required. 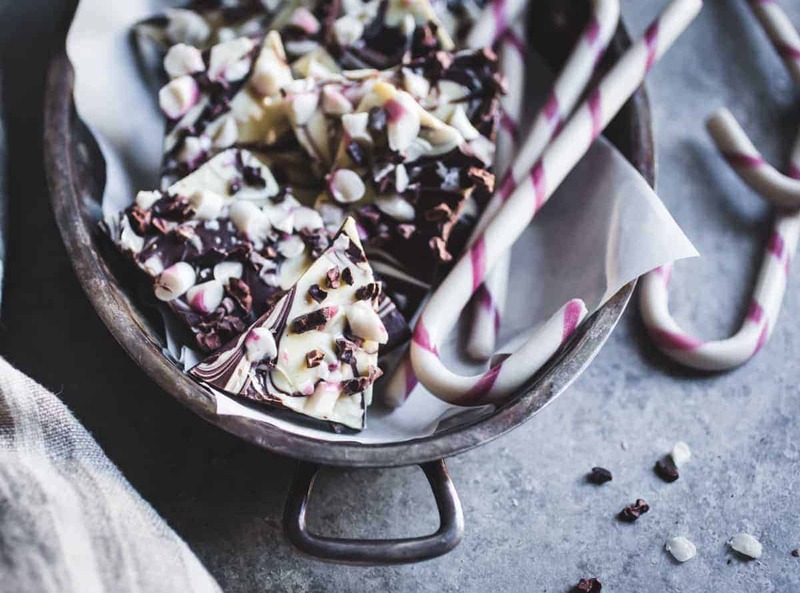 This all-natural peppermint bark uses organic chocolates and naturally-dyed candy cane. See the variation below for a green-swirled variation made with matcha. 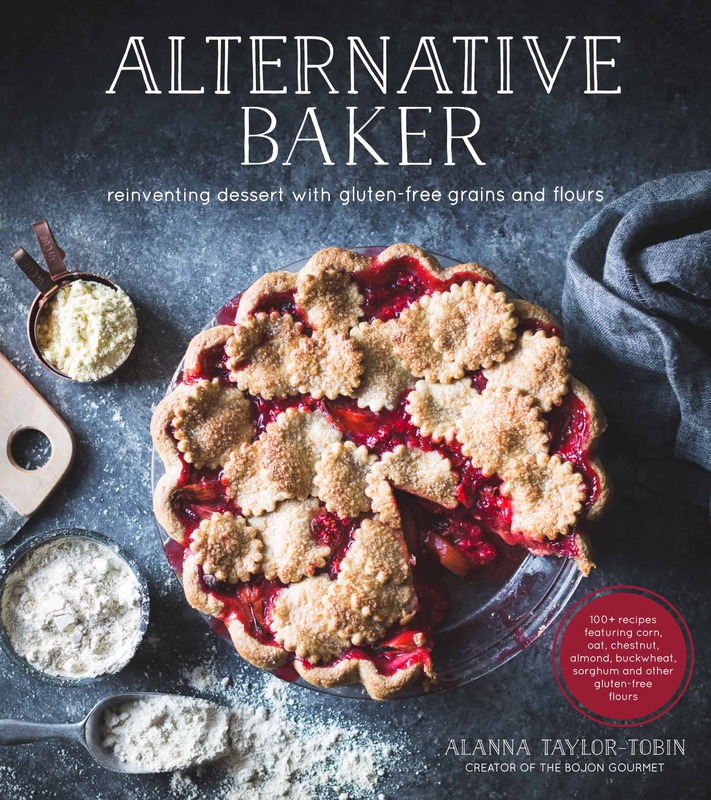 Something unexpected happened this year as I baked my way through an entire cookbook of desserts: my tastes changed, in a direction I never saw coming. I would have thought that eating more sweets would cause me to crave more sweets, or that I would become so immune to sweetness that I would need more and more sugar to register things as sweet enough. Instead, I seem to have become hyper-sensitive to sweet. 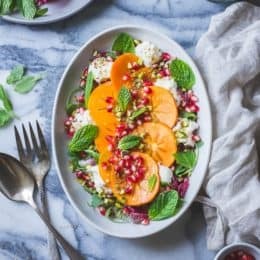 I find myself choosing a glass of minerally white wine over cocktails, salty snacks over cloying energy bars, and a gooey triple-cream cheese over (or at least in addition to) dessert. I cringe at sugar-containing salad dressing. I find the thought of biting into a conventional candy bar nauseating. And I’ve become the type of diner to ask the bartender/server prior to ordering a beverage/dessert, “Is it very sweet?” with a wrinkle of the nose. The recent chill in the air brought on a fierce yearning for peppermint bark, and when I found a tin of bean-to-bark variety made by Askinosie with all-natural ingredients and goat’s milk in the white chocolate, I snapped it up. It was perfectly balanced: a little sweet, a little bitter, a little funky, and just the right degree of pepperminty. I happily munched away at piece after piece (with a small glass of whiskey) after dinner each night (while watching Gilmore Girls with Jay and Catamus) until it was empty, and I realized that I’d better hurry up and make my own not-too-sweet, all-natural peppermint bark before I became destitute. 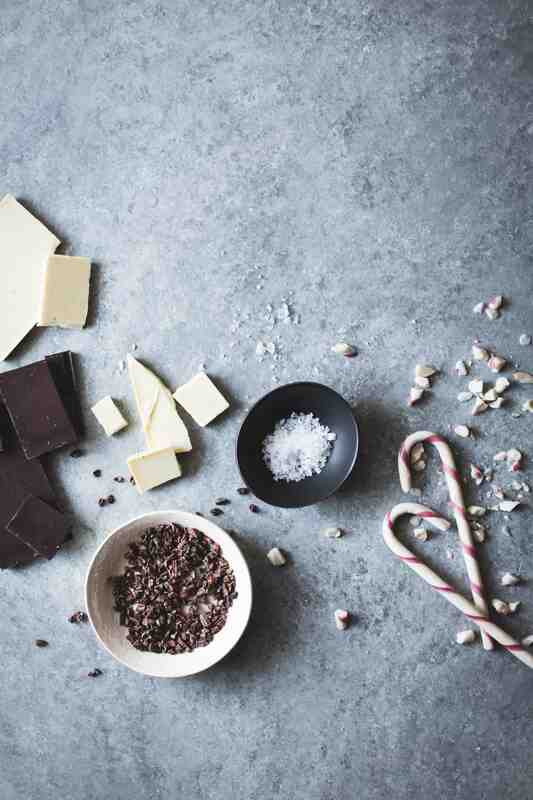 I knew I needed a deep, dark chocolate and perhaps a handful of bitter cacao nibs and pinch of flaky salt to balance to balance the inescapable sweetness of crushed candy canes and white chocolate. So I headed to the co-op for provisions, certain I would find some candy canes devoid of red dye #40 as well as my preferred brands of chocolate. After searching every aisle for candy canes and asking a similarly bewildered worker, I finally found them with the holiday herbal teas. Just one more reason to love that place. Next came the eternal chocolate question: to temper or not to temper? 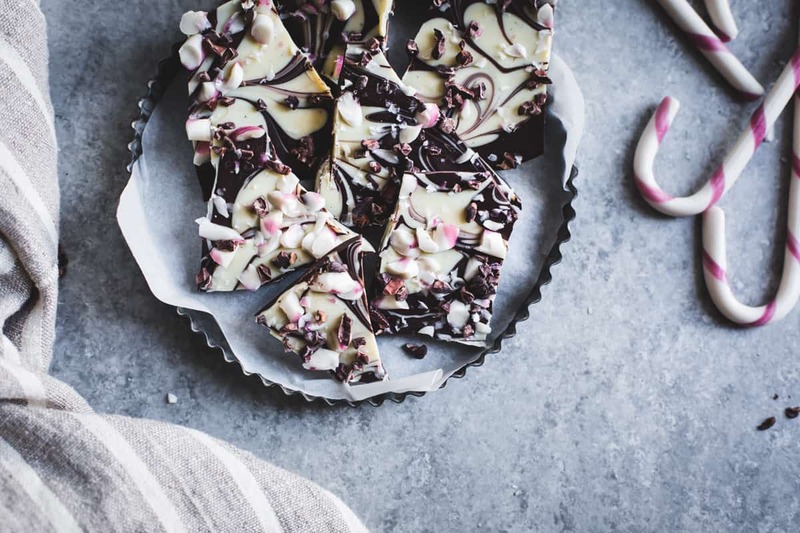 Inspired by this stunning recipe from Laura at Tutti Dolci, I wanted to swirl my bark, and I knew that getting the timing right if tempering both chocolates would be tricky. I remembered my teacher from pastry school telling us that oil could be added to chocolate to give it a fake temper, meaning that it won’t bloom or become streaky at room temperature, the downside being that it won’t have the snap of tempered chocolate. I went with coconut oil, and it worked like a charm. 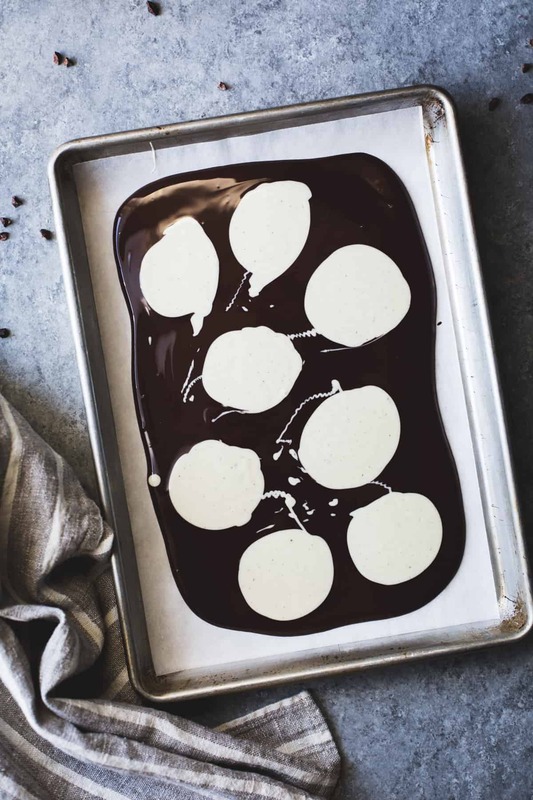 The pockets of white chocolate end up with a soft texture, almost like a firmly set ganache, and the dark chocolate is stable enough to keep at cool room temperature and, though it’s a bit softer than regular chocolate, it doesn’t melt too terribly fast in your fingers. The bits of nibs add crunch, and just enough peppermint extract makes the bark delightfully minty without reminding one of toothpaste. 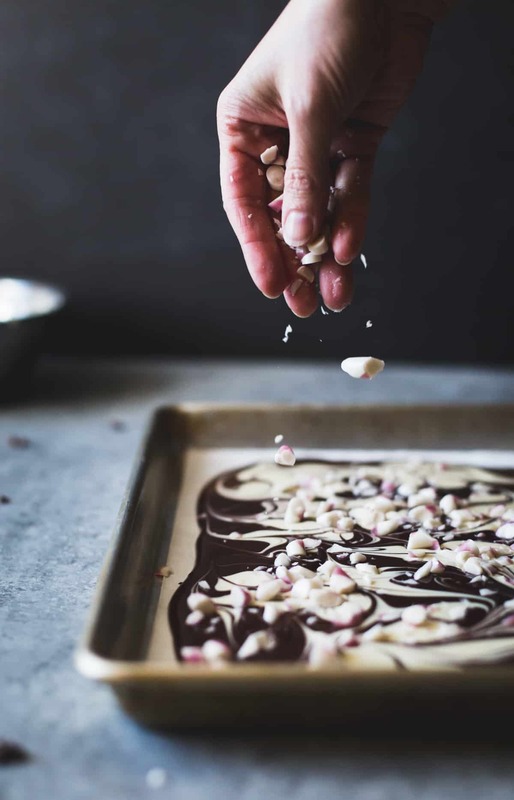 This all-natural peppermint bark is about the easiest thing you can make, perfect for gift-giving. 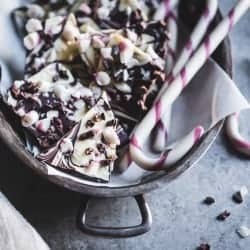 I’ve loved watching peoples’ eyes light up when I offer them a piece of peppermint bark, and I find myself reaching for the tin more throughout the day than I would expect, sweet tooth or no. I’ll leave you with my favorite song about sweets by David Rawlings and Gillian Welch, an upbeat cautionary tale of sugar addiction. 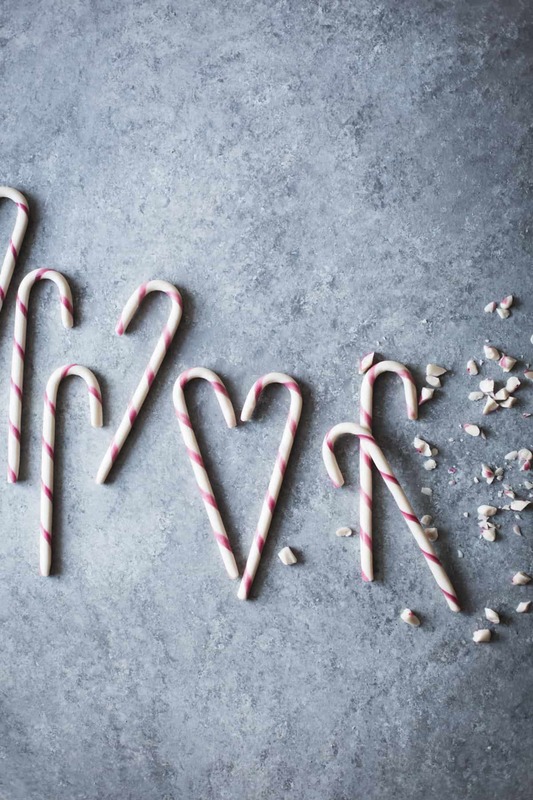 Wishing everyone a sweet holiday season! 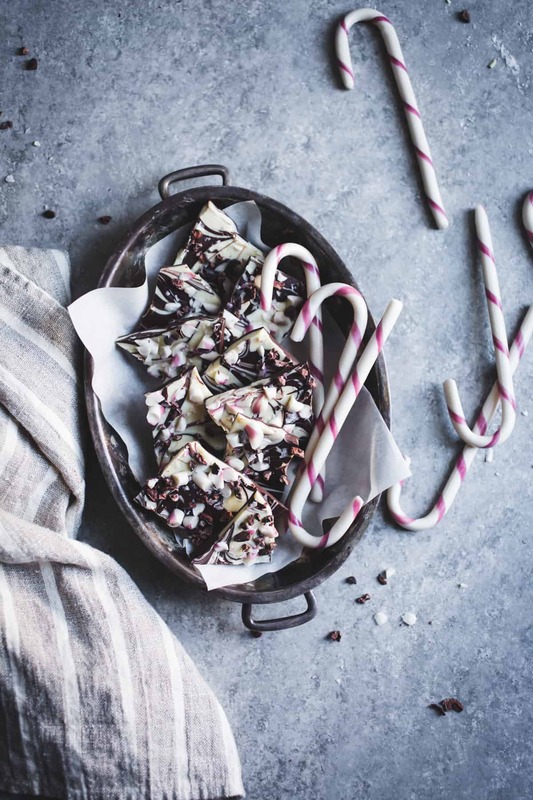 A not-too-sweet, all-natural chocolate peppermint bark showered with cacao nibs, flaky salt, and organic candy canes. Be sure to use chocolates that you like the flavor of on their own. For dark, I like Guittard, Scharffenberger, Recchiuti and Tcho's bittersweet chocolates. My white chocolate of choice is organic Green and Black's, which is rich with cacao butter and flecks of vanilla bean. Big pieces of candy cane look pretty, but smaller bits are easier to eat; I try to find somewhere in the middle. This makes a smallish batch of bark; feel free to double the recipe and spread it onto a larger baking sheet. I like the hint of coconut flavor the oil adds here, but I think you could use butter, ghee, or a neutral vegetable oil (grapeseed or sunflower) in its place. Peppermint extracts vary in strength, so start with less if using a different brand than Frontier. Before you start, make sure that anything that will touch your melting chocolate is bone-dry; a small drop of water can cause the whole thing to seize up. Also, take extra care when melting the white chocolate and follow the directions closely as it can burn easily; you want the water bath to be gently steaming, not simmering. Fill two smallish saucepans with 2 inches of water and bring both to a bare simmer. Turn off the heat. Place the dark chocolate in a medium-sized heatproof bowl and set over a steamy pot of water. Place the white chocolate in a small heat-proof bowl and set over the other pot. Stir the chocolates occasionally until smooth and melted, 3-5 minutes. Add a few drops of peppermint extract and 1 teaspoon of the coconut oil to the white chocolate and stir to combine and melt the coconut oil. 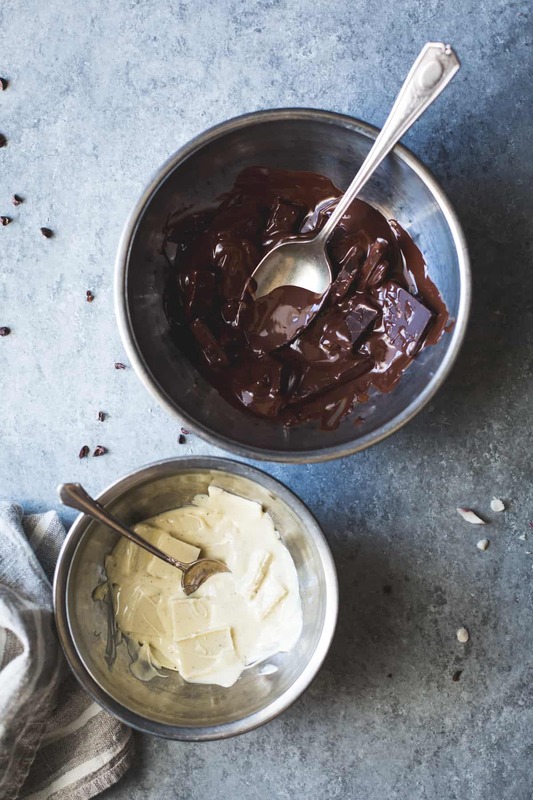 Place the 1/4 teaspoon peppermint extract and remaining 2 teaspoons coconut oil in the dark chocolate and stir to combine and melt the coconut oil. Line a small (9x12") baking sheet with parchment paper. 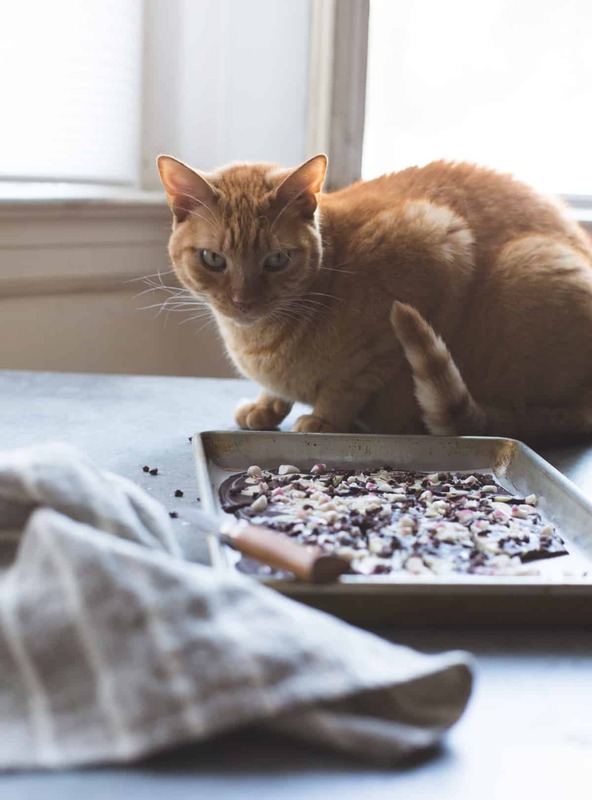 Carefully remove the bowl of dark chocolate (pull it toward you quickly to avoid a steam burn from the hot water beneath) and dry the bottom of the bowl on a kitchen towel; this will prevent steamy water drops from marring your bark as you pour the chocolate. Scrape the dark chocolate mixture onto the parchment and spread it to 1/4" thickness. 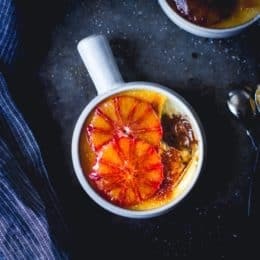 Remove the bowl of white chocolate in the same manner, and use a teaspoon to dollop the white chocolate mixture evenly over the dark chocolate in round pools. Use the tip of a chopstick or wooden skewer to swirl the chocolates together. While the chocolate is still soft, sprinkle evenly with the candy cane pieces, cacao nibs and flaky salt. Place the bark in the refrigerator until firm, about 30 minutes. Remove from the refrigerator and use the tip of a butter knife to break up the bark into rough 2-inch pieces. Store refrigerated airtight or at cool room temperature for up to 1-2 weeks. To make a matcha swirl, divide the white chocolate mixture in half and add about 1/4 teaspoon matcha powder (or as much as you like flavor- and color-wise). Proceed with the recipe. Has no sweet receptors, still wants all the peppermint bark. Not wanting to eat things that are super sweet all the time is a GREAT thing to happen to you! I love the way the white chocolate looks in this bark swirled in – really beautiful! i love the idea of adding cacao nibs to the bark. it sounds like it’d add a different crunch / slightly bitter component to the bark, which seems pretty darn refreshing and new to me! It does just that. Thanks lady! Absolutely gorgeous, stunning – beautiful. As always! I’ve tried tempering chcolate before to no success, and would like to keep trying in the future. Nevertheless, good tip about adding oil to chocolate for that glossy look. In regarda to your shift in tastes, the same thing happened to me during my macaron baking phase. 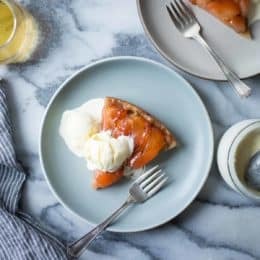 It changed my preference towards sweet treats entirely and what seemed like an indulgence previously now has me wincing when I eat something overly sweet. I find myself searching for a balance of something else to temper the sweetness. Thanks for this recipe, I cannot wait to try it. Especially so since you’ve described your new preference towards sweets which I find similar to mine. which is getting to be something of a tradition. last year i read your recipe for spiced cocoa polvorones after i had finished my baking. subbed espresso powder for the cinnamon and chile, mixed some cocoa powder with the powdered sugar and renamed them chocolate-espresso snow balls. just finished baking the first tray. Whoa, your bark sounds epic – save me some! Chocolate espresso snowballs sound amaaaaaazing. 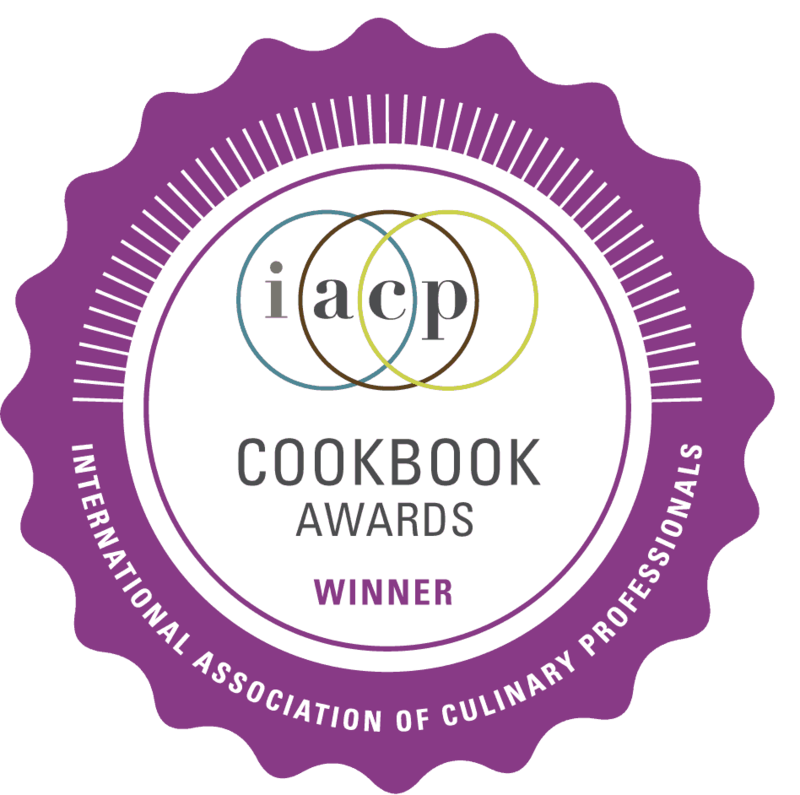 Oh dear, I love the idea of having your coookbook!!! I wish I have a friend traveling to America by the end of April, so she/he could bring it to me. Congrats! Your Argentinean fan, wishing you Happy Holidays and a Happy New Year! 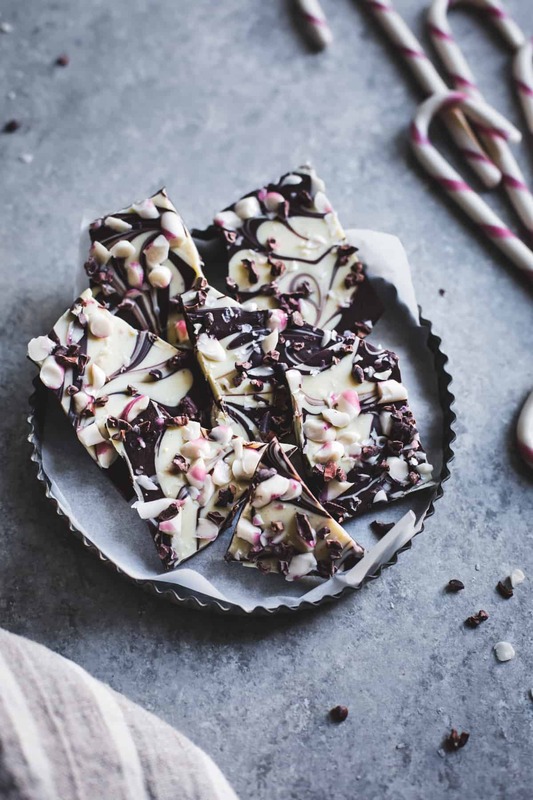 I’m on the same page today, swirly peppermint bark is irresistible and I love your grown up version. I’m going to try your coconut oil trick in my next batch. DUDE. We are seriously on the same page. I gave a friend some peppermint bark and she accidentally called it peanut butter bark, and I started thinking of making bark with peanut butter chips. TWINS! Your swirls are tooooooo beauteous! Love love love. 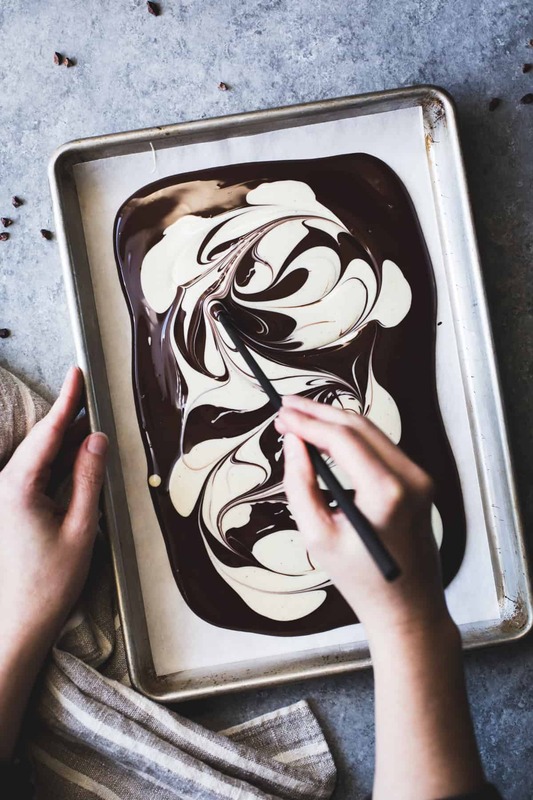 and while i was poking around looking at various white chocolates, i came across a DIY caramelized white chocolate on david lebovitz’s site that would be devastatingly good swirled into dark chocolate and finished with with cocoa nibs and flaky salt, and maybe some hazelnuts. Ohhhhh I’ve been wanting to try that recipe since, well, 2009! Your idea sounds absolutely awesome!!! 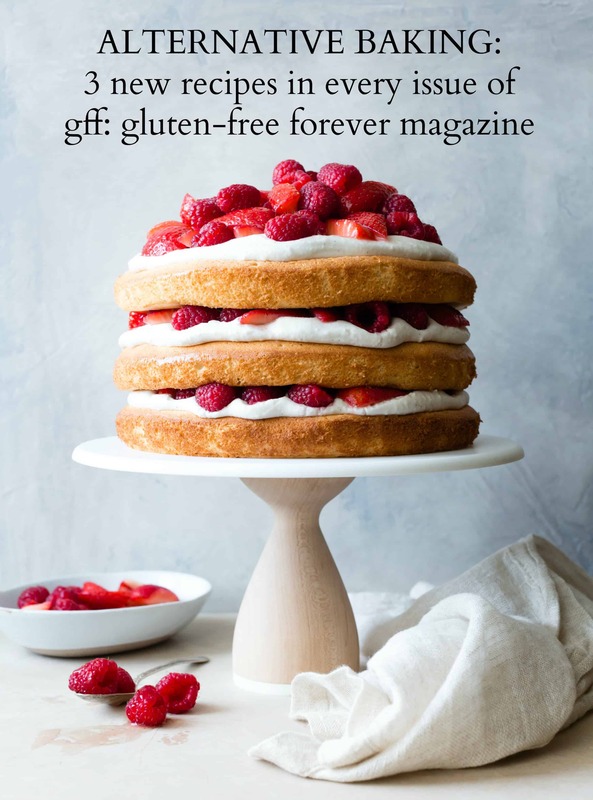 Thank *you* for the constant inspiration and beautiful sweet treats. 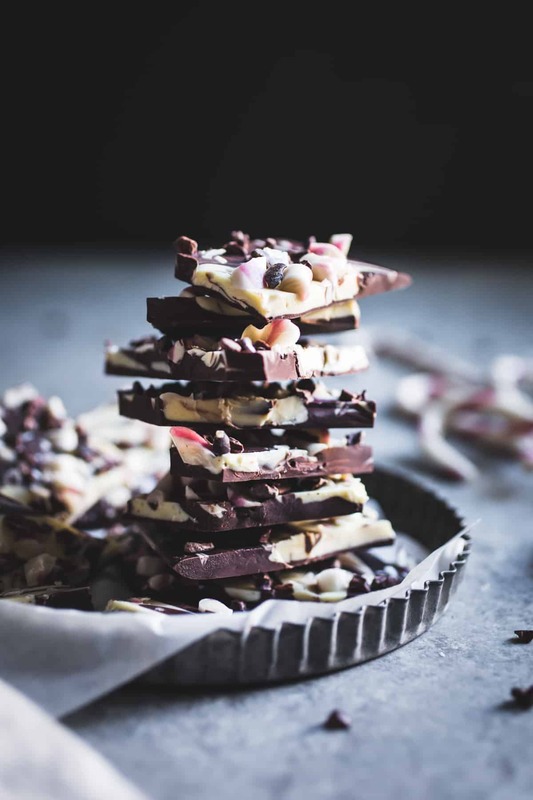 Chocolate bark is such a DIY gift! And it’s just one of those things I can’t stop nibbling on. Gorgeous, gorgeous photos! I can’t resist dark chocolate with a bit of salt… too yummy! 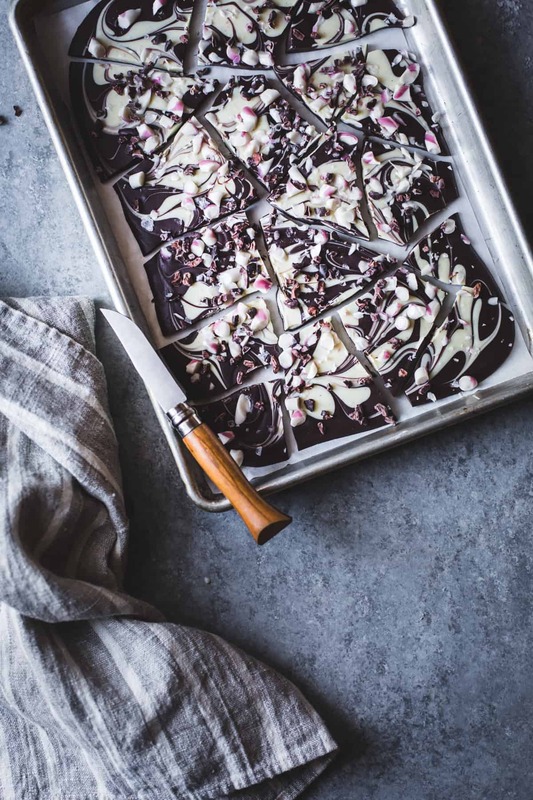 Oh wow, I love dark chocolate, love peppermint and love cacao nibs so I need to make this ASAP! :-) Photos are gorgeous, specially the one where you are making marble effect, stunning! You’ve done it again! By which I mean had the best food blog photos of anyone out there. Especially the pouring/scattering shots which are always my faves :) In any case, the bark looks seriously great and I hadn’t known about the oil trick either, that’s a relief to know. Silly question but I’m confused with the coconut oil bit. After adding it, does the chocolate still snap or is it soft?